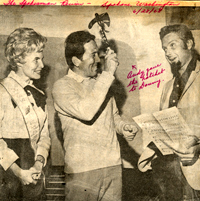 Note: Olive Osmond noted on the photo in the paper that the hatchet that Andy Williams is holding was given to Donny. Something big happened at the Spokane Coliseum Thursday night, something that may have saved the day for Spokane entertainment. That something was recording star Andy Williams. Williams and an all-star cast drew the largest crowd of any nationally prominent performer to appear in Spokane in recent years. A little more than 6,800 persons filled nearly every seat in the building. Programs were sold out before the show started. From the entertainment scene, it was a definite save, according to local promoters who jubilantly surveyed the crowd at intermission. Many leading performers have failed to draw much more than 2,000 persons recently admitted the promoters. Andy Williams stormed his way through a solid hour of songs. Adding to the storm were flash bulbs that cracked the darkness like lightning and a faulty sound system that crackled like thunder, somewhat distracting to the large crowd. Williams enchanted the crowd with his thoroughly familiar repertoire of the record hits, such as Moon River, Born Free, Dear Heart, Danny Boy, Up Up and Away and Somewhere. Backing him up quite ably were the five Osmond Brothers, but it was a sixth Osmond, four-year old Jimmy, who stole much of the show. In a pure white Nehru suite matching those of his brothers, he belted out I Like Rock and Roll and I Got A Woman. Certainly not to be overlooked was the great performance of Peter Nero and the rest of his trio, Gene Cherico, on the bass, and Jose Cusatis, on the drums. For 50 minutes, they thrilled the audience with Show Me, Night and Day, I’ve Got Rhythm and a special arrangement of The Sound of Music.